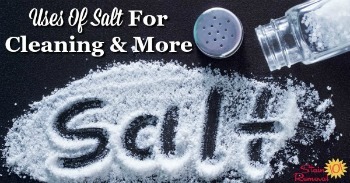 Did you know there are uses for salt around your home for things besides just cooking? 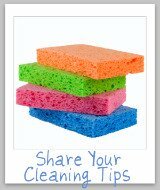 Salt is a natural way to clean your home and remove certain stains too. Table salt is something almost everyone has in their home, to use in cooking and for eating, so why not use it in other ways too? The great thing about using salt for these additional purposes is that it is natural and nontoxic, so it is safe for use around your family without fear of harsh chemicals. All of the salt uses below can be done with regular table salt, but in addition you could use kosher salt, sea salt or another coarse salt. In fact, when using salt to take advantage of its abrasive qualities it is best to use a coarse salt because the larger chunks, by their very nature, are more abrasive than the more finely ground table salt. Salt can be used for cleaning based on one of its several qualities, including as an abrasive, for its chemical properties, or because of its high melting point. 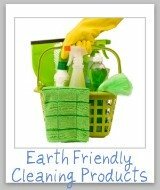 As stated above one of the ways salt can be used for cleaning is as a mild, non-toxic abrasive. Because salt can be ingested it is often used for cleaning cookware and other items where using harsh chemicals might not be advised because of the fear of later ingestion of chemical residues. Salt is also sometimes used for its chemical properties to help clean items around your home. For example, you can clean badly burned pots and pans with non-stick coating using salt water. All you do is filled the burnt pot with cold water and add 2-3 tablespoons of salt and let it sit overnight. In the morning bring the salt water to a boil and this should get rid of the burn marks. If the pot is severly burned you may need to repeat these steps a couple of times, but it should eventually all come off. Then, just wash the pot as normal before using it again. Keep your salt from clumping in your salt shaker by adding 5-10 grains of rice to absorb moisture. 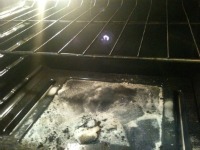 Another of the uses for salt is to help contain oven spills (see the picture to the left). Using salt in this way takes advantage of its high melting point. It is difficult (but not impossible) to burn salt. Therefore, when something spills in your oven, like a pie bubbling over, for example, immediately cover the spill with salt. The salt will help keep the spill from burning and smoking, which can cause odors and set off the smoke detector. Then, once the oven is cool you can clean up the spill more easily because it will not be as baked on. 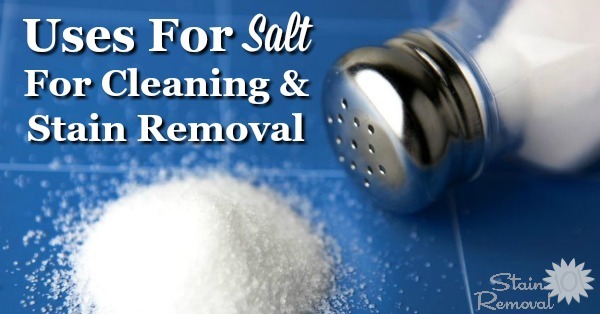 Salt can also be used to help remove certain types of stains, including red wine, blood and perspiration. In addition, salt can be used to absorb grease from fabric, in a similar way to baking soda. The ability of salt to absorb grease is also helpful when you need to remove greasy residue from pots and pans. Just sprinkle salt into the bottom of the greasy pan and use a dry sponge to rub the salt around until it absorbs the grease. You can also use salt to kill weeds. 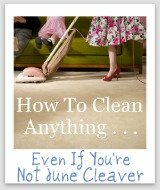 Check out this video explaining how to get rid of dandelions naturally, with salt. Of course, you could use salt to kill all kinds of weeds, not just dandelions. Of course, like most things, salt cannot be used for every situation and is not the perfect cleaner. In fact, salt can stain things, such as your shoes or car upholstery and carpeting after you walk around on a salted sidewalk in winter, for example. 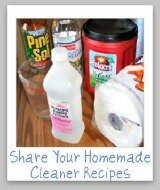 How Do You Use Salt For Cleaning Or Stain Removal? 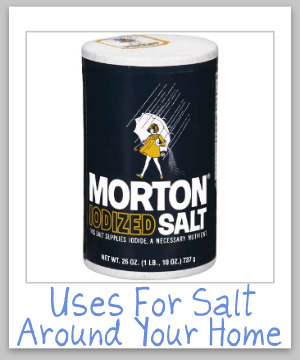 I know there are even more uses for salt around our homes besides what I have mentioned above. 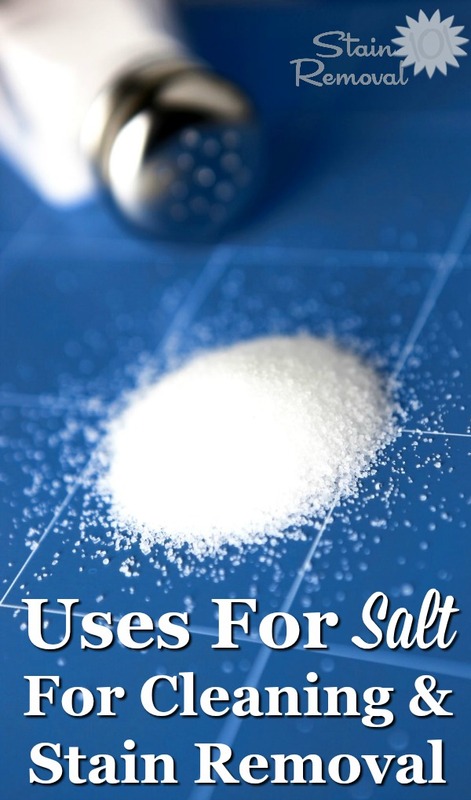 You can check out even more uses for salt here, or even share your own tips and uses too!